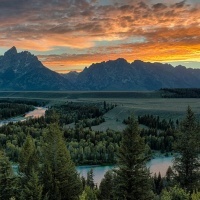 For unbelievable views, visit these eight amazing waterfalls in Yellowstone National Park, Grand Teton National Park, and Bridger-Teton National Forest. 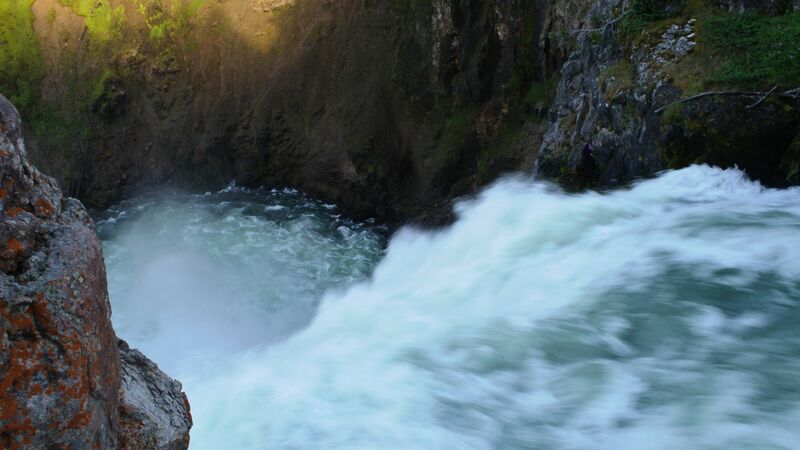 When planning your visit to Jackson Hole, put a few of these landmark waterfalls on your list. The falls offer unparalleled beauty and peacefulness. 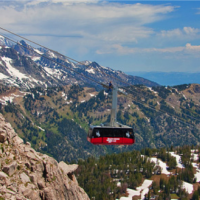 Here are some of the top waterfalls to view when you visit Jackson Hole and tour Yellowstone National Park, Grand Teton National Park, or Bridger-Teton National Forest. 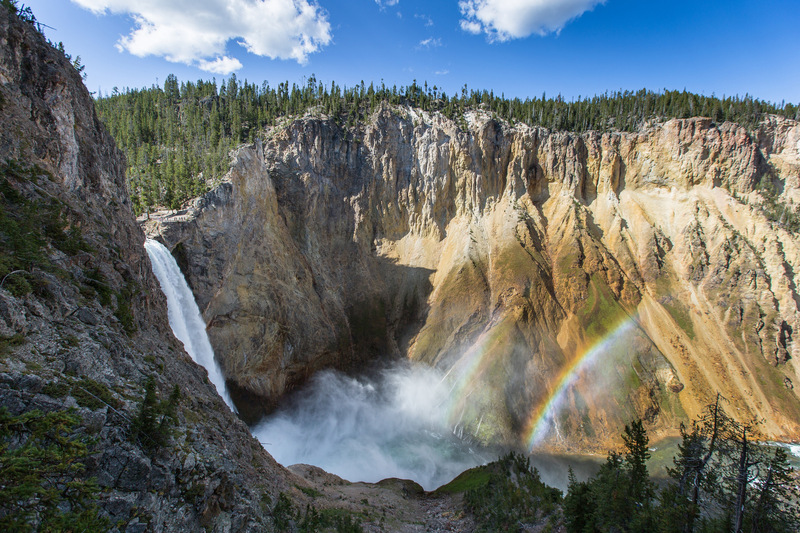 These are the two biggest and most famous waterfalls in Yellowstone. Head to Canyon Village in Yellowstone National Park to access this series of waterfalls running through about 20 miles of deep canyons. When you get to Canyon Village, head East and follow the loop drive that takes you to the beginning of the Grand Canyon. Here there will be four different viewpoint areas from which to see the Lower Falls, which flows with 63,500 gallons of water per second at its peak! You can also hike to the top of the Lower Falls. The hike involves a few steep switchbacks but it is well worth the effort for the breathtaking views. 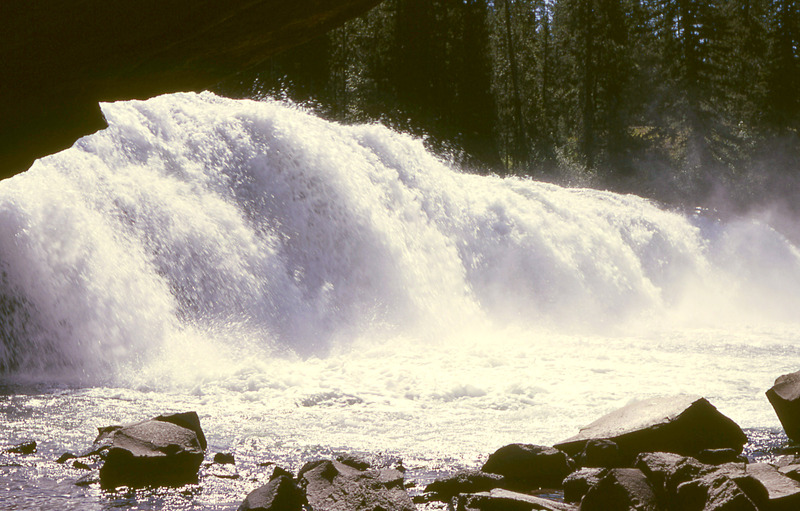 The Upper Falls are best viewed from Uncle Tom’s Lookout, accessible by the Uncle Tom’s Trail. If you are looking for an easy hike that brings you to a majestic waterfall, then this is it. Head to the parking area near Jenny Lake in Grand Teton National Park. From this starting point, you can either walk around the lake or take a ferry across. Taking the ferry reduces the total hike by 2 miles (4 miles roundtrip). Once across the lake, you will follow the trail into the forest until you hit the base of this gorgeous cascading waterfall. 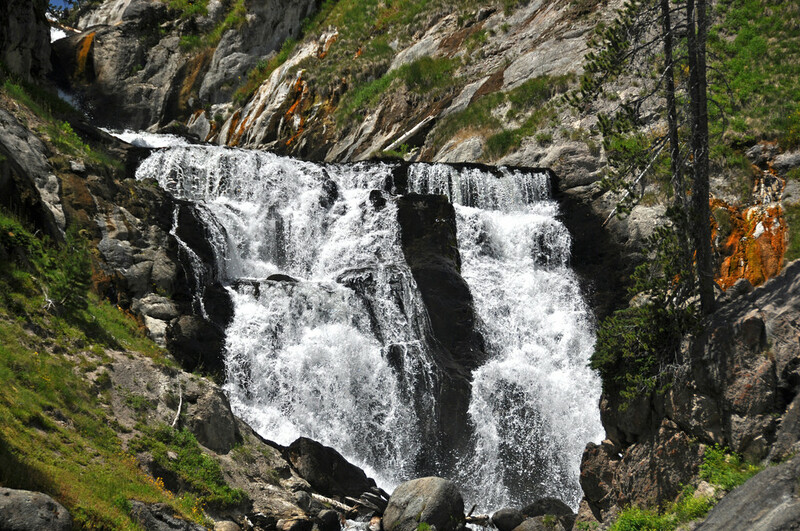 Hidden Falls is one of the most visited waterfalls in Grand Teton National Park. Lewis Falls is a great first stop to make once you enter Yellowstone National Park from the South Entrance near Jackson Hole, Wyoming. The falls are just 10 miles past the entrance. There is a dedicated Lewis Falls Trail and plenty of places to explore and picnic near the water. Cave Falls is just inside the southwestern tip of Yellowstone National Park. 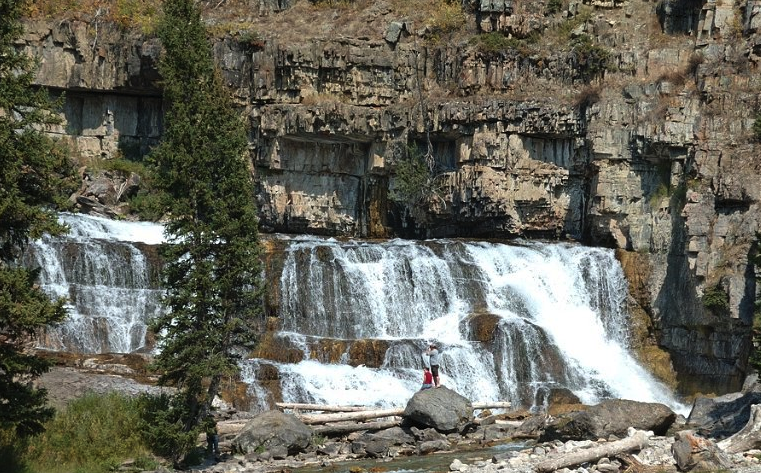 You can reach this waterfall by driving East of Ashton, Idaho. It is the park’s widest waterfall at 250 feet across but its shortest in vertical drop. This waterfall gets its name from a cave that used to be located just to the side of the falls. Unfortunately, the namesake cave has collapsed is no longer accessible to hikers. Tower Falls is just that, a towering waterfall plunging 132 feet to the ground floor. Due to erosion, hiking to the base of the waterfall is no longer permitted. You can get great views from a nearby overlook and there are a set of pinnacles just above the falls, which makes for picturesque photos. Walk for three-quarters of a mile past the Tower Fall overlook and you will also be able to see the creek flowing into the Yellowstone River. 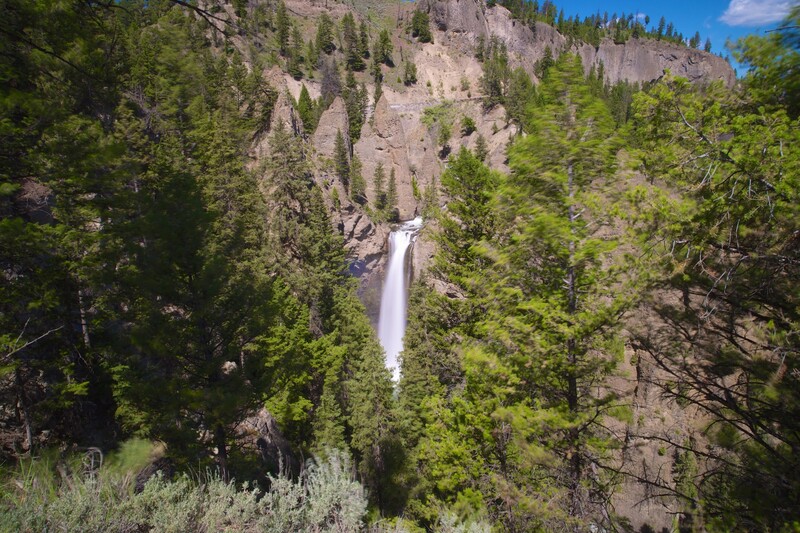 Gibbon Falls is located near the caldera rim of the Yellowstone Supervolcano. After parking above the falls, there is a gently sloping paved walkway that provides multiple viewpoints. The best time to view Gibbon Falls is in the early evening, as it is a western facing waterfall. The shape of these falls and surrounding stone walls were formed from a lava river, which gives you an idea of just how big this volcano actually is! 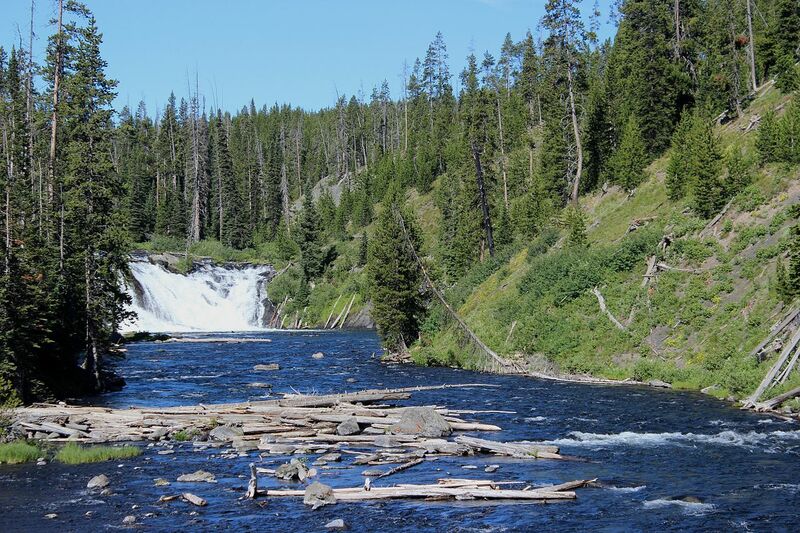 Mystic Falls can be reached from the Biscuit Basin boardwalks in Yellowstone National Park. If you are looking for a quick yet steep hike, there is a 3-mile loop that continues past the waterfall up to the junction with the Fairy Creek Trail. The river drops 70 feet as it flows between a narrow area into a wider basin at the bottom. 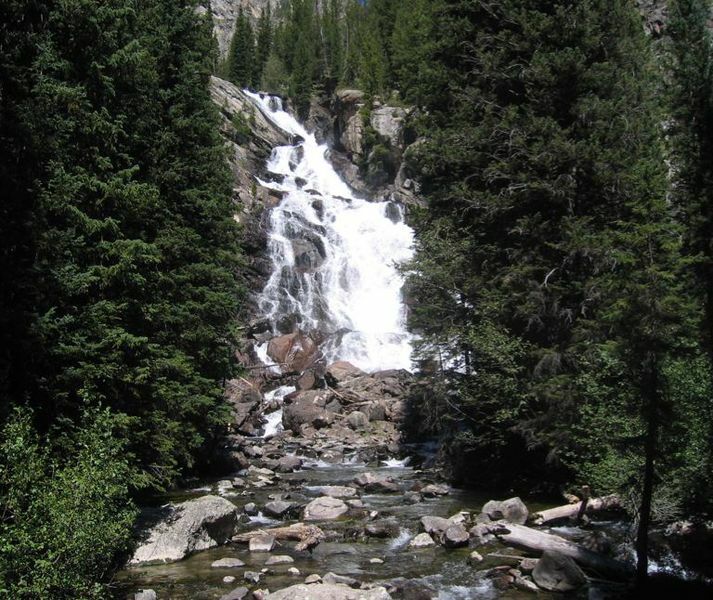 This beautiful waterfall runs strong through summer and winter in Bridger-Teton National Forest. It is a great place to stop for a break on your way to Granite Hot Springs. Once the spring run-off has settled down, visitors can wade across the river to a natural hot spring pool. In the winter time, the only way to see this waterfall is by snowmobile, dog sled, or cross-country ski trip, and as the snow sticks and temperatures plummet, the waterfall starts to freeze. It is a magical sight in every season! Have you visited any of these beautiful waterfalls yet? 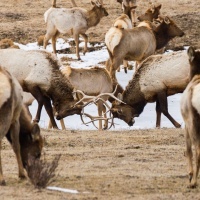 If you'd like to explore Yellowstone and Grand Teton National Parks - our local experts can help you plan the perfect itinerary. Give us a call at (888) 838-6606 to start planning!